This is the rarest form of non-syndromic craniosynostosis, making up only 1-3% of all cases of isolated craniosynostosis. 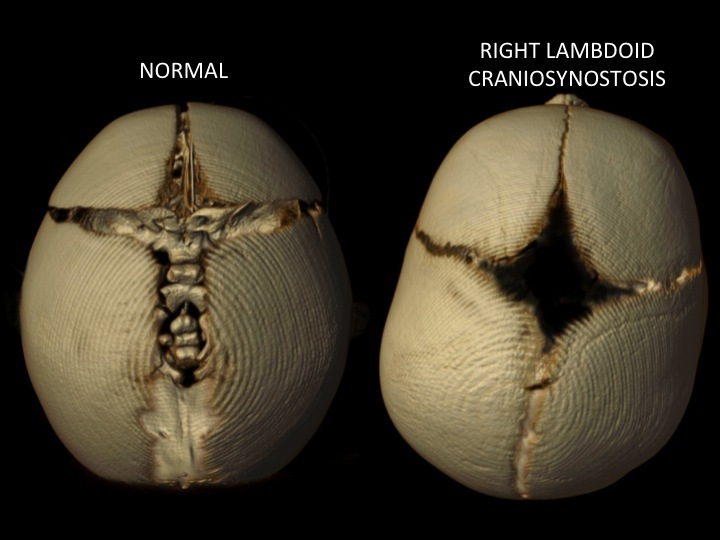 The characteristic features of lambdoid synostosis include a tilting down of the hairline at the back of the head. There us also a large downward (mastoid) bulge behind the ear on the side of the closed suture. The side opposite the closed suture grows away from the closed suture which widens the back of the head on the side. This top down view shows compensatory growth to the left, away from the closed lambdoid suture. The above image compares a view of the back of the skull of a normal skull and one with right lambdoid synostosis with the red arrow showing the location of the closed suture. The tilt of the red line on the right image shows the change in the cranial base angle and the dotted circle highlights the downward mastoid bulge. The affects on the appearance of the face can range from no affects to significant asymmetry. The ears on the side of closed suture may be uneven in their position on the head compared with the other ear. Most patients with this form of craniosynostosis have heads that are larger in middle and back thirds of the skull on the side opposite the closed suture. This is due to the sutures on the opposite side making room to compensate for the closed suture opposite them. These patients require an open cranial vault remodeling. In this procedure the side of the closed suture is expanded and the compensatory growth of the opposite side is reduced to provide a symmetric and normal head shape. The patient below has right lambdoid synostosis. His CT scan is shown above. The pictures show flattening of the right side of the back of the head and compensatory overgrowth and increased height on the left side. This makes the back of the head look tilted over to the patient's left. Note how the increased height and width of the skull on the left side of the back of the head frames the face unevenly. After reconstruction the face and skull look more balanced. The top down view shows that the back of the back of the head is flattened on the right and wider and taller on the left. After reconstruction the skull is much more even in its appearance.